Finding 0 point WW foods can be very challenging. Especially ones that are both smart and yummy! So, I was thrilled when I came across these super-delicious fiber-enriched fruit bars at Trader Joes, which, with 60 calories and 6 grams of fiber, cost 0 WW points to eat! These fruit leathers are quite big in size (20g), and they come in a wide variety of tasty flavors such as apricot, mixed berry (my personal favorite), boysenberry, and strawberry. Sometimes I'll eat one of these fruity treats before I go out to a restaurant to curb my hunger, which makes me less tempted to order something really bad for my diet when dining out. These Fiberful bars have no added sugar (or fake sugar, which I passionately avoid) and are made from natural ingredients (including natural dried fruit, flaxseed which is high in omega 3, and fiber). They are also super cheap! The only possible drawback of the bars is that they have added natural fiber in the form of inulin (you can read a good article I found about inulin here), which, is believed to cause gas (like most fiber) in some people when eating large quantities of it. I also have another favorite natural "smooshed" fruit bar which I buy at Whole Foods called Fruitabu, which I'll blog about soon. Unfortunately, it is 1 WW point instead of 0 (although it is only 40 calories, it has no fiber), but is worth talking about for those of you who aren't counting points. Enjoy your Trader Joe's Fiberful Fruit Bars! A few other low calorie bars I've blogged about worth checking out: Gnu Foods, Clif Z Bars, Luna Tea Cakes, Fruitabu, Attune probiotic bar, Clif Z Bars, and Figamajigs. I agree- they are yummy. They also have a pinapple fruit bar-sold near the Fruitful Fiber bars and it has less fiber, but it is also 0 WW points. Thanks Frances. I can't wait to try the Pineapple bar! Where are they located in Trader Joes? I could not find them today. Hi Emily. At my Trader Joes, they are located with the other "protein bars" like Balance, Clif, etc. They might be along the bottom somewhere. I was so excited to see these on this site! I am quite new to dieting and watching what I eat (I'm 17) and I got hooked on these before I knew about this blog. They are delicious and so low in calories, yet they still provide me with energy before exercising (plus it's a serving of fruit!). 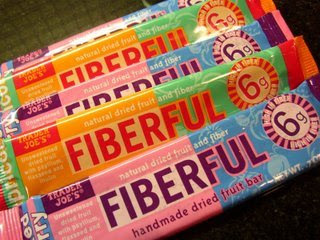 I just found this while googling the Fiberful bar! They are sooo yummy! Thanks so much for this tip! I love these bars. Is it cheating if I eat it three times a day and still count it as zero points? Yelena... i was wondering the same thing. Did you ever find an answer? If you eat three bars, the calories = 180; fat = 0; fiber = 18. If you enter these totals in the WW calculator, the points = 3.... mmm... not sure what to make of this.